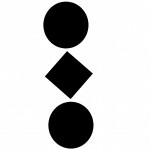 It is a mid channel mark, go to the right of it. Where on a planing hull, must the registration symbols "numbers and letters" be displayed? Where on a planing vessel must the registration "sticky" label be displayed? When operating a vessel outside of smooth or partially smooth waters, what is the required reduction of the vessels maximum capacity? Within what timeframe must you report a marine incident? What is the primary emergency channel on a 27mhz Marine radio? What is the maximum speed limit in smooth waters? When travelling outside smooth and partially smooth waters, at what distance off the coastline are you required to carry an EPIRB, as part of your safety equipment? Which vessels must powerboats give way to? What is the legal alcohol limit on the water in QLD for people with an open licence? When are adults required to wear a lifejacket in Queensland? What lights does a recreational vessel display when at anchor? When are sea conditions likely to be the roughest? What lights does a trawler display when it's nets are out? 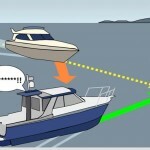 If you have right of way with a boat approaching 300 metres away on your port side what should you do? 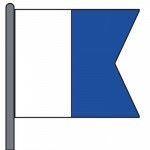 What does the blue and white swallow tail flag, code flag alpha indicate? If a vessel sounds 3 shorts blasts on it's horn what is it signalling? If the vessel you were operating struck an unknown object in open waters and was quickly filling up with water and about to sink, what type of call would you make on your marine radio? Which recreational vessels require registration in Qld? 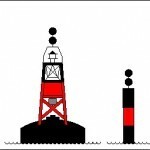 What does a beacon or a buoy with 2 black discs on top and a red band indicate? Isolated danger mark, go either side 30m+ clear as there is danger below. Middle of Channel mark, go right of it. Also the greatest clearance under a bridge. What should you do if you see a Yellow Mark, with an X on it? Consult your chart or Beacon to Beacon book as it is a case by case hazard. Where must you place a capacity label? What does a beacon or buoy that has arrows pointing up and down with a yellow stripe between black bands indicate?